Michigan’s roster is starting to come into focus with the news that Caris LeVert will be returning for his senior season and big man Austin Davis will be a Wolverine. The next question is: what does that mean for Michigan’s recruiting going forward? Michigan’s roster is starting to come into focus with the news that Caris LeVert will be returning for his senior season and big man Austin Davis will be a Wolverine. The next question is: what does that mean for Michigan’s recruiting going forward? It’s no secret that Michigan is starting to work with a crowded scholarship situation, but don’t expect the Wolverines to be done recruiting any time soon. John Beilein has been out on the road recruiting class of 2015 and 2016 prospects over the last few weeks – even with the understanding that LeVert was leaning toward returning to school. Expect Michigan to continue recruiting in the class of 2015 and 2016 as it searches for a point guard and a wing to balance out the roster. Including 2016 commitments, there will be eight players standing 6-foot-7 or taller on the roster when the class of 2016 arrives. With only 13 scholarships to give, that means there are only two or three trusted ball handlers in the mix. From here on out, Michigan’s recruiting focus has to be on adding perimeter talent. Remember, this is an offense that has played essentially four guards for the majority of John Beilein’s tenure in Ann Arbor. Here’s a rundown of Michigan’s top targets in both classes and a brief update on where things stand. As of right now, I’d expect Michigan to try to land two more players in the class of 2015 and 2016 combined — a point guard and a wing guard. 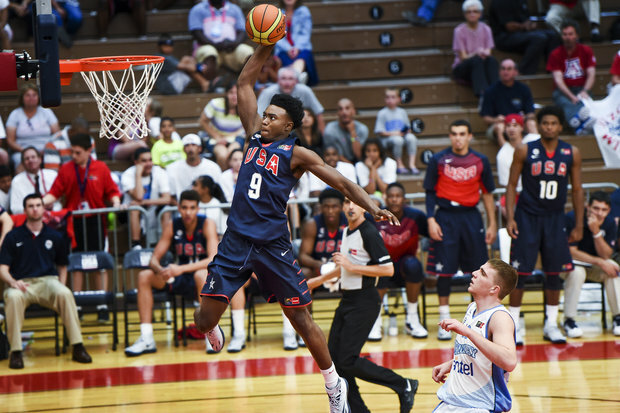 If one of those players is Jaylen Brown, a presumed one-and-done, then I’d expect the Wolverines to continue recruiting 2016 wings to replace him. Brown is the best available recruit in the 2015 class and has Michigan in his top eight. The Wolverines hosted him on an official visit last month and he plans to start working toward a decision in the next several weeks. There’s very little concrete information about Brown’s recruitment – he managed to take an unofficial visit on the other side of the country without anyone knowing – but ESPN’s Paul Biancardi said on ESPN Recruiting Nation that Michigan could be one of Brown’s favorites. Brown told ZagsBlog that he hadn’t cut his list at this time. Given the lack of information regarding Brown’s recruitment, it feels like this one could still have a few more twists and turns. Most recently, Brown had discussed making a decision in April, but no formal decision date or timeline has been set. A VCU decommitment and former Michigan target last summer, Kenny Williams is one of the best shooters in the class of 2015. He’s now one of the hottest recruits available in the country. John Beilein made an in-school visit last week and it appears that Williams will setup a trip to Ann Arbor. A date hasn’t been finalized for that trip, but Michigan is still recruiting him with LeVert in the fold, according to a report by MLive. Williams took an official visit to North Carolina over the weekend and also visited Virginia unofficially on Tuesday. Michigan is considered one of the favorites in Williams’ recruitment, but the next step is setting up a trip to Ann Arbor. Williams isn’t a point guard so adding his commitment could mean that Michigan’s focus in the class of 2016 shifts squarely to the point guard spot — or at least on prospects that could play both guard spots. Michigan State has made a strong push in Winston’s recruitment, but Michigan remains very much in the mix. The Detroit Jesuit guard has visited Michigan at least a half dozen times in the last year and he’s one of the most complete offensive point guards in the class. John Beilein watched the versatile point guard over the live evaluation weekend and Michigan is one of the schools recruiting him the hardest. That being said, the Kentucky native could be difficult to pull out of the Bluegrass State if Louisville or Kentucky start to prioritize him in their plans. Jamal Murray is a hot commodity and there’s a very real chance that he will reclassify to the class of 2015. While he hasn’t made a decision on reclassification, Kentucky and others appear to want him in the class of 2015. John Beilein watched him in March and remains in the mix, as his father told ESPN that “everything is in discussion,” and listed Syracuse, Louisville, Michigan, Oregon, Wake Forest and Illinois among others. California native has starred with Team USA youth squads and is known for his quickness and defense despite his small stature. He was supposed to visit Michigan last summer, but an injury forced him to reschedule. A newer point guard target on the board, Turner is a top-100 guard who attends IMG Academy in Florida. Beilein was spotted catching one of his games at the Nike EYBL circuit and he could be an intriguing option to track this spring and summer. Battle is planning to take an official visit to Michigan on May 8th and also just wrapped up his first two official visits to Duke and Louisville. The wing guard isn’t playing AAU this spring and the May official visit could be very important for the Wolverines. “He’s probably just going to go through the process and just pick a school,” Battle’s father told Scout.com. “It’s not that we don’t like the recruiting process, but there are some other things that he needs to get along with. Langford has taken multiple visits to Michigan and is one of the top prospects on the board. He’s also emerged nationally after a big weekend on the adidas Gauntlet circuit. Langford had in-home visits with Arizona and Kentucky this week and both schools extended a scholarship offer. UCLA also jumped into the mix with a scholarship offer. Towns’ previous top two was presumed to be Michigan and Ohio State, but both schools grabbed commitments from class of 2016 big men in the last week. What does that mean for Towns? It’s tough to say just yet, but the 6-foot-7 wing had plenty of opportunity to commit to either school over the last several months. Huerter blew up on the Nike EYBL circuit last weekend and has received interest from Michigan — even before his national blow up. Baylor, Rice, Creighton, Maryland, Penn State, Marquette, Texas Tech and Miami all offered the 6-foot-5 guard after his big weekend in Virginia. John Beilein made an in-home visit with Huerter on Tuesday evening and you can bet that the Wolverines will be paying close attention to him in Lexington this weekend. John Beilein has strong ties to the upstate New York area and could be a factor in his recruitment going forward. Michigan State has long been presumed a favorite for Bridges, but Michigan has ratcheted up its interest in the athletic wing from Flint, who plays his prep ball at Huntington in West Virginia.